Ashley Outhouse, studying abroad in London at the Royal School of Needlework, recaps a recent tour of Buckingham Palace state rooms, where she discovered an exhibition on the Queen’s wardrobe. Today we toured the state rooms at Buckingham Palace. Buckingham Palace is where the Queen, her husband and other members of the Royal Family live. It is also where the Queen carries out her duties as Head of State of the United Kingdom. I was surprised when I saw there was an exhibition that was centered on the Queen’s wardrobe. There are so many of her gowns, outfits, hats, and military attire on display. The Queen’s style is very classy yet fun at the same time. The one exhibition that is currently on display for the public to view is: Fashioning a Reign, 90 years of style from the Queen’s wardrobe. This is a special exhibition to celebrate the Queen’s 90th birthday. The top designers that I saw recurring were Norman Hartnell, Sir Hardy Amies and Ian Thomas. Both the Queen’s wedding dress and coronation gown are on display together. 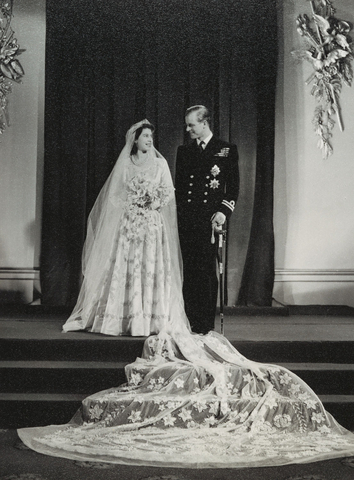 The Queen is pictured below in her wedding dress from 1953 and the Duke of Edinburgh. In person you can see how intricate the embroidery really is. Pictured next is the Queen’s coronation dress. On our audio guides it said that the Queen wanted to incorporate other nations into the design of this dress. Little details such as some of the leaves and beadwork was truly thought out. 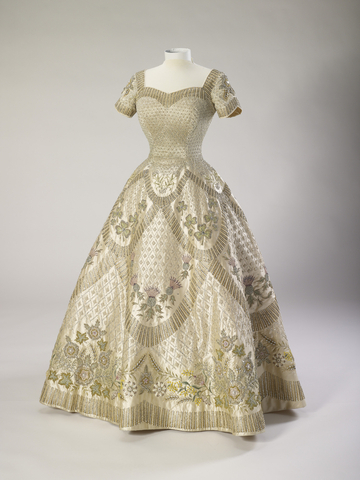 This exhibit was the first time that the Queen’s wedding dress and coronation dress were on display together. After we toured Buckingham Palace we had the chance to have a tour of Angel’s Costumes. There we saw a replica of the Queen’s coronation dress. It was nothing like the original, pointing out the major differences was neat. I really enjoyed touring the state rooms and I would definitely recommend it to others traveling around London.